Victorian decorative cast iron represents an important and relatively early example of mechanically reproduced design. 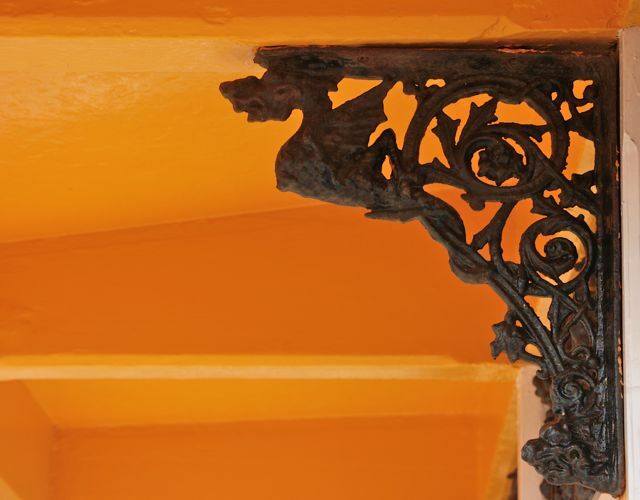 Unlike wrought iron, which is hand-crafted, cast iron results from a mechanical process: a pattern is made in wood or metal and this is cast in a bed of sand to produce the finished product. This can then be reproduced endlessly, illustrated by the two examples shown here: identical brackets in Bristol and Portsmouth. They were made in Glasgow, at the Saracen Foundry of Walter Macfarlane. We take for granted the fact that products we buy are mechanically reproduced: we expect them to be exactly the same as any other produced by the relevant company or brand. Yet, we buy certain objects – particularly clothes – to feel special, individual, set apart from others. This generates a contradiction, which is a fundamental aspect of consumer societies today. Yet, it began to take effect only in the nineteenth century. The rapid dissemination of ornamental cast iron represents an important instance of this and came under close scrutiny by critics. Some, like John Ruskin, despised it because they hated the very fact of industrial production, longing for an age when products were made by hand, with craftsmen indelibly linked to the things that they made. Decorative cast iron represented the separation of art and work, the work of the craftsman being replaced by a manufacturing process. Others regarded this as a positive development: mechanical reproduction democratised art by disseminating it to the many rather than the few. These two examples – probably produced in the 1880s – represent a time when cast iron reached a height of ornamentalism. 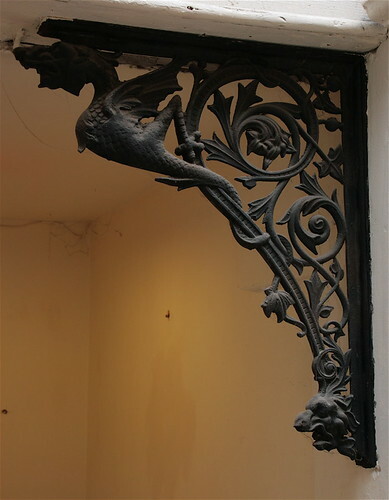 The fantastical design is typical of its time: at the base of the bracket a grotesque head merges with the sinuous tail of a dragon, wrapped around a sprig of foliage which fills the space inside the bracket. Here, decoration performs no ‘function’, other than to invest the bracket with elevated qualities then associated with ornament and hand-crafted works of art. In others words, this decoration suggests a designer, but this is undercut by the fact that the same design is seen in two places that cannot be easily connected. In fact, the brackets would have probably been acquired through the pages of a trade catalogue, in this case those of the iron founder Walter Macfarlane, based in Glasgow. In these catalogues, no designers are credited, the brackets being advertised as just one product among countless others. Yet, they are different , not as a result of design but rather of their context – the bracket in the Portsmouth shelter is weathered by time and the elements; that in the Bristol arcade is still pristine in its clearly-defined forms. So, how can we interpret these objects? If Walter Benjamin has argued that mechanically-reproduced works of art lacked authenticity, a real presence in time and space, where do these objects stand? Well, to get anywhere, we have to ask questions not normally posed about works of art: who decided to acquire these objects and for what purpose? Who was involved in the manufacturing process and how did they interact? How were these objects perceived in their distinct environments? It seems to me that the question of context is crucial. Even though these objects were made in the same way and to the same design, their meaning is determined primarily by the places in which they appear; the function and use of a seaside shelter are very different from a shopping arcade. In this way, decorative cast iron can be understood as contributing to the making of different environments – worlds where intention and perception are of the utmost significance. It is in iron’s place in these worlds where its meaning is made.